Over the past month, we have taken a look at the people and the companies that help make the Summit SuperSeries possible. And at the very top of that list are two companies that make this program the biggest and most popular bracket racing program in the world – Summit Racing Equipment and AMSOIL. Be sure to support Summit Racing Equipment and AMSOIL at a race near you! From its beginnings in 2002, the Summit SuperSeries has grown into the preeminent program for grassroots drag racing thanks to the support and dedication of Summit Racing Equipment. Designed to give racers an opportunity to compete for a world championship on the big stage at the IHRA Summit Racing Equipment World Finals through a multi-stage, year-long competition, the SuperSeries has blossomed from a small, one-class championship in 2002 to a three class competition in 2014 with well over 5,000 participants throughout the United States, Canada and beyond. The Summit SuperSeries World Championship consists of the best 16 racers in each category competing in a winner-takes-all championship race. Over $200,000 in cash and prizes is awarded to Summit SuperSeries participants, including a cash prize awarded to all qualified participant tracks. 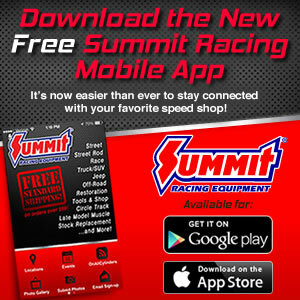 “We are very fortunate to have a great partner in sportsman racing like Summit. Their commitment to all of IHRA sportsman racing is tremendous,” said Scott Gardner, President of IHRA Motorsports. “Summit Racing supports those that support them – the hard working racers that put in all that time to be able to do what they love. Summit Racing Equipment is a major supporter of the IHRA and motorsports enthusiasts around the globe, sponsoring other major programs such as the IHRA’s Summit Pro-Am Tour, Summit Team Finals, Summit World Finals and contingency program. In 2012, AMSOIL signed on with the IHRA. And the rest, as they say, is history. In just three years, AMSOIL has built a strong presence in the IHRA sportsman community with its products powering some of the top racers in the sport today. AMSOIL also backs many of IHRA’s top sportsman programs, including the Pro-Am Tour, SuperSeries, Team Finals, Tournament of Champions, and Junior Dragster programs, giving AMSOIL a great opportunity to showcase its industry-leading synthetic lubricants for the drag racing community. In addition to being the Official Oil of IHRA, Nitro Jam and Sonic Rush Tour and presenting sponsor for all IHRA Summit Racing Equipment sportsman programs, AMSOIL has had a presence at nearly all IHRA events with vendors and AMSOIL representation at races throughout North America. AMSOIL has been the recognized leader in synthetic lubricants since 1972. For more information about AMSOIL synthetic motor oils, call (715) 392-7101 or contact AMSOIL INC. at www.amsoil.com. For more information about AMSOIL Racing, go to www.amsoilracing.com or follow them on Facebook.